At Metro-Polo's UK head office the staff are preparing for their annual budget meeting. In this lesson we look at Metro-Polo UK's financial performance and see how individual departments present their figures as they fight for their individual budget allocations for the coming year. Dee works in the advertising department. She is British. Nigel works in the advertising department. He is British. Ida is Advertising Department Manager. She is British. Alan Scott is Managing Director. He is British. Glyn is the Company Accountant. He is British. Vikki Denson is responsible for Franchise Development. She is American. Sarah works in Glyn's department. She is British. All of these characters apart from Arturo work at Metro-Polo UK. Vocabulary Financial performance; forecasting and budgeting. Skills Taking part in meetings; defending a position in discussion; using figures and percentages in discussion. Documents A summary of business objectives; a sales chart. It is September 1991. In the UK head office of Metro-Polo, the Chief Accountant has circulated these figures. Are the 1991 figures better or worse than the figures for 1990? Nigel and Dee work in the advertising department. They are discussing the figures in 15.1. Listen to what they say. Why are people worried by the figures? DEE Why are people so upset by these figures? NIGEL Well, 1990 was pretty good. 1991 was disappointing. It's the 1992 figures that are worrying. DEE They look OK to me. NIGEL Well, starting at the top - capital employed looks like being a hundred thousand pounds below target. But there's going to be over a million shortfall on revenue. DEE Well, does that matter? NIGEL It is over twenty-five per cent! DEE But profits are up over 1991 - almost double, in fact. NIGEL It's true the profit margin is quite healthy. But I'm afraid what counts is the return on capital, and the forecast for that is still way down, six point eight per cent below what it should be. Nigel and Dee are joined by Ida, the Advertising Department Manager. They are preparing for the budget meeting. Listen to wnat they say. What is their main concern for the meeting? IDA What gets me is that revenue forecast for 1992. Why is it so low? NIGEL I've been on to Accounts , and I've also talked to Franchise Development. They say it's because of very uneven performances by franchisees. Some are doing well, others are struggling. IDA I suppose the lame ducks are falling behind on their payments. DEE Yes, and some of the ones that are doing well aren't paying anything extra to us, because a lot of the franchise agreements have a clause in them freezing royalties for the first three years. IDA For heaven's sake! I thought royalties were performance-linked - a percentage of turnover? DEE They are, but this was a gimmick that Metro-Polo used when they started up in the UK. You know - the first fifty applicants get special concessions. NIGEL Look, we can't waste time talking about the finer points of franchise agreements. We have to increase our spend - particularly in local news media. DEE I thought we agreed, Nigel, office environment decision-makers don't listen to local radio stations? IDA Just a minute! Hold on, will you? We can argue about our budget allocations later. I agree that we have a strong case for more money, but let's work out how we should present it - bearing in mind, of course, that they're going to try to cut us back. The meeting to discuss the next year's budgets is about to start. It may be a difficult meeting. Alan Scott is the Managing Director. Listen to him describe how the meeting will proceed. ALAN Ladies and gentlemen - if I may have your attention - thank you. We have to examine this afternoon our departmental budgets for the coming financial year, in the light of recent information on the company's performance in 1991/92. I'm going to ask each department head to make a brief statement of the projected figures and the reasoning behind them. Then I shall open up the meeting to a general discussion. First of all, though, Glyn, I'd like you to take us through the performance projection in a little more detail. ALAN Well, only time will tell. Right! Let's go round the departments now. Vikki - Franchise Development? VIKKI I think everyone has a copy of our paper - anyone without? No? Right, I'll start by explaining how we see our place in the corporate plan, and come back to the figures later. As you know, the plan envisages a fairly rapid growth rate , with a return on capital of twenty per cent from year four onwards. This implies that expansion is going to be financed from retained profits, at any rate for the foreseeable future. 1 Not paying at the proper time. 2 Holding payments at a fixed amount. 3 Low payments, as an incentive to join or to buy. 4 The divisions of money that have been allocated. 5 Being careful not to forget. 6 Please listen to me. 7 The twelve-month accounting period that is about to begin. 8 The income and expenditure that each person expects. 9 Explain to us what each part of the document means. 10 The rest of the year is not likely to bring results that will make up for the first half. The meeting continues. Listen to what they say. Notice how Ida makes her points quite forcefully, and how Alan keeps the meeting on course. VIKKI And so finally, I'd like to re-affirm my department's commitment to achieving the company's objectives. We believe it can be done - only a slight shift in emphasis is necessary. IDA Mr Chairman, forgive me for interrupting, but may I ask how we're supposed to see this 'slight shift of emphasis'? Is this a key strategy , or just a tactical response to a problem? VIKKI Does it make any difference what we call it? It's still the same thing. IDA It makes a great deal of difference. What you're proposing could lead the company down a totally different road in its development. ALAN I'm sorry, I'd rather not get sidetracked into discussion at this stage - you'll all have plenty of opportunity for questions later. Now, may we proceed? Ida, how do you see advertising over the next twelve months? The meeting continues. Listen to what they say. Listen to how Ida gives a very positive image of the advertising department. Why does she speak in this way? IDA I think we're kidding ourselves if we talk about these results as a hiccup in the company's strategy. Well, let's face it, as far as the UK is concerned we're just another start-up franchise organisation. Nobody owes us a living. We've got to promote our brand image to office managers and site managers. Now, the figures before you show how accurately we can target our advertising, using a mix of trade journals, trade directories, Yellow Pages , local news media to a limited extent, and a co-ordinated programme of mail shots. ALAN Just a moment, please, Ida. It all sounds very exciting, but could we get to your actual budget figures? IDA Yeah, of course. Well, in brief, the advertising department is looking for an across-the-board expenditure increase in 1992/93 of eighty-five per cent. I know it sounds like a lot of money. But bearing in mind inflation, and the increase in media rates, in real terms it's a much smaller increase than we asked for, and got, last year. We all agree that we must grow. I don't think we can afford anything less. ALAN I can see some of you want to come back on what Ida has just said , but I think it's only fair to give the working groups a chance to put their heads together . We'll adjourn for twenty minutes. Back at four o'clock, please. Listen to this conversation. Then listen again and speak the part of the woman. MAN It's results that count, and, quite frankly, your department isn't delivering. WOMAN I think I ought to remind you that our results last year were thirty per cent over target. MAN Some of us were sixty per cent over target. WOMAN And a hundred per cent over budget. MAN Let's face it , if we're to increase our market share, we've got to spend money. We have to have five hundred new franchises this year - never mind what it costs. WOMAN So budget overruns don't matter? MAN Provided the bottom line looks good. Vikki has gone to the canteen to get some coffee. She bumps into Arturo Foscatelli. Listen to what they say. Will Vikki support Ida's budget? VIKKI Black coffee, please, no sugar - thank you. Oh! I'm sorry, I didn't see you. Mr Foscatelli! ARTURO My fault, my fault. Ah! Miss Denson. You're just the person I wanted to see. Are you in a hurry? VIKKI No, the budget meeting is adjourned for a while, so I thought I'd grab a coffee. ARTURO How's it going in there? VIKKI Well, obviously you've seen the expected performance figures for this year. Advertising are making a case for a huge increase in budget, and I'm about to go back in and tell Alan why I think they shouldn't get it. 1 Make people recognise our products and approve of them. 2 A bit, but not too much. 3 The cost of buying advertising space in newspapers, time on TV, etc. 4 Allowing for inflation and the fall in the value of money. 5 Drink a cup of coffee in a hurry. 6 The results that are forecast. 7 Putting forward reasons for doing something. The meeting resumes, and Arturo joins the others. Does Alan Scott agree with Arturo's assessment of Metro-Polo's performance? ALAN Ladies and gentlemen! Right, I'd like to welcome Signor Arturo Foscatelli, our founder and president. ARTURO Thank you! I have just completed a tour of our franchisees in the United Kingdom and I must say I am very much encouraged by what I've seen. ALAN That's good news, Mr Foscatelli, but I think I ought to tell you that some of us here are not very happy about the way things are going. ARTURO Perhaps that's because you have been looking at figures while I have been talking to people. But I don't want to take up your time; please carry on. ALAN Thank you. I'd now like to open up the meeting to questions and discussion. Vikki, I think you had something you wanted to say? As chairman of the meeting, Alan Scott makes informal notes of what happens and of what is said. These are brief and not at all detailed, but they will remind him later of the points he will make in his report. Listen again to all the extracts from the meeting that you have heard so far, and write these notes for him. Write a few words about each point, just enough to help you to remember later. As you listen to further extracts in this lesson, continue making notes. The meeting continues. Listen to what they say. Is Nigel friendly or hostile to Vikki? What about Alan? VIKKI Yes. 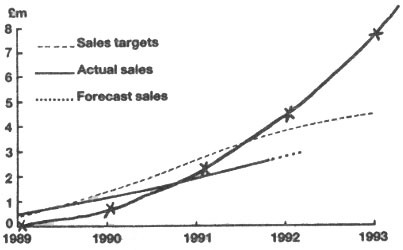 I'd like to have a second look at the sales chart that was distributed at the start of this meeting. VIKKI The sales gap analysis. Ida and her team used it to show that we ought to spend more on advertising. Now, on this chart, I'd like to plot the money that's been spent already. The scale on the y-axis will be different , of course; we can read it in hundreds of thousands instead of millions. It's the shape of the curve that I'm interested in. NIGEL With respect, may I ask just what this exercise is supposed to achieve? ALAN All in good time. Vikki? This is the chart that the advertising department used to present their figures. Vikki is going to use it to make her case against advertising. As you listen to 15.15, mark the points on the chart, and then join them into a curve. Vikki dictates figures so that the others can mark them on their copies of the chart. Listen to what they say. Why does Ida protest? VIKKI The advertising expenditure in 1989 was negligible, because the franchise wasn't fully operational. In 1990 it was fifty thousand; 1991 - a hundred and seventy thousand; 1992 - four hundred and ten thousand pounds. NIGEL Hang on , what was 1992 again? VIKKI Four-ten. Right. We can only get a whole-year figure for 1993 based on the advertising department's proposals: their budget will amount to - four hundred and ten thousand times one point eight five - nearly seven hundred and sixty thousand. What happens after that, in 1994 and '95, is anybody's guess. But let's join the dots and see what the curve looks like. IDA Mr Chairman, and Mr Foscatelli, I really must protest. We didn't come here today to play party games. ARTURO Oh, I rather enjoy party games. Look at this line. It goes up even more steeply than the sales forecast. The meeting continues. Listen to how Vikki and Ida use the figures to present their own analyses of the chart. Does Ida think that 20% is high or low? What about Vikki? VIKKI Thank you! That's precisely my point. An eight-fold increase in advertising over two years has produced less than two and a half times the revenue. IDA And how do you suppose we got the extra revenue? An extra three hundred and sixty thousand in advertising to bring in an increase in turnover of one point six million! Or to put it another way, in 1991 our advertising budget was ten point five per cent of total outgoings. In 1992 it rose to eighteen per cent. IDA But - but, according to our 1993 figures, even with my proposed eighty-five per cent increase, advertising will still only account for twenty per cent of outgoings. Twenty per cent! ALAN Ladies, ladies, please! Mr Foscatelli? ARTURO All I wanted to say was that these 1993 figures are simply targets, and the way we're going I'm afraid we're going to fall short of them. Figures are valuable, statistics are valuable, but statistics, especially percentages, can hide as much as they reveal. What matters to me is the bottom line. NIGEL I'm very glad to hear you say that, sir. I was afraid we were going to lose sight of it altogether. The meeting continues. Listen to what they say. Why does Ida ask her question about 'no confidence'? Why, at the end, is Ida so angry? ARTURO A franchise network is only as good as its franchisees. I've just seen a cross-section of our people and I am impressed. Our selection procedures are obviously working well. It does seem to me, however, that on the training side we are falling down somewhat. IDA Forgive me for interrupting. Are we to take this as a motion of no confidence in Franchise Development? ALAN Hold on, Ida - don't jump the gun. ARTURO All the advertising in the world will not help our brand image if our franchisees are not running their own businesses efficiently. The budget that I would like to see rise sharply next year is that for education and training. NIGEL How do you think the money should be spent? VIKKI I really don't think the president should be expected to answer a question like that off the top of his head. I would like to point out, however, that my remarks at the beginning of this meeting echo what Mr Foscatelli has just said. IDA It can't be easy echoing something that hasn't been said yet! Glyn is explaining to Sarah, one of his staff, how Ida prepared her figures. First, read through the dialogue, and try to work out what the missing figures are by re-reading the documents in this lesson. Then check your figures by listening to what they say. SARAH I must admit I didn't quite follow Ida's figures at the meeting yesterday. Where did she get them from? GLYN You mean things like a more spent on advertising, bringing in a b increase in turnover? She was comparing the figures for 1990 and '92. In 1990 we spent c on advertising. In '92 it was up to d - right? That's an increase of three hundred and sixty thousand pounds. But turnover rose from one point one five million to e - that's a f increase. SARAH But she tried to show that advertising had got wonderful results. The percentages she was using - were they correct? Where did she get them from? GLYN She was talking about advertising as a percentage of all expenditure. In 1991, revenue was g and profits were h , so outgoings must have been roughly one point six two million. Advertising was i , which is about ten per cent of outgoings. SARAH But in 1993 she said advertising would still be only twenty per cent of outgoings. Why was the figure so low? GLYN Ah, that was where she went wrong. She assumed that the target figures would be the real ones. The target figures for '93 are actually quite high, with revenue at j , and profit at k . That means outgoings would be about three and three quarter million pounds. So her big advertising target would be quite small in comparison - about twenty per cent, in fact.